Edmond (atau Edmund) Halley, FRS (disebut /ˈɛdmənd ˈhæli/; 8 November 1656 – 14 Januari 1741) ialah seorang ahli astronomi, ahli geofizik, ahli matematik, ahli meteorologi, dan ahli fizik Inggeris yang terkenal kerana mengira orbit komet Halley. Beliau merupakan Ahli Astronomi Diraja kedua di Britain, menggantikan John Flamsteed. Halley berkahwin dengan Mary Tooke pada 1682 dan menetap di Islington. Pasangan ini mempunyai tiga anak. ^ Hughes, David W.; Green, Daniel W. E. (January 2007). "Halley's First Name: Edmond or Edmund" (PDF). International Comet Quarterly. Universiti Harvard: 14. 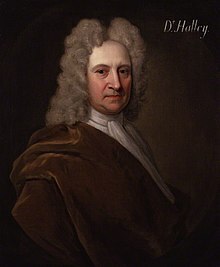 Might we suggest... simply recogniz[ing] both forms, noting that—in the days when Halley lived—there was no rigid 'correct' spelling], and that this particular astronomer seemed to prefer the 'u' over the 'o' in his published works. ^ Jones, Daniel; Gimson, Alfred C. (1977) . Everyman's English Pronunciation Dictionary. Everyman's Reference Library (edisi 14). London: J. M. Dent & Sons. ISBN 0-460-03029-9. ^ Kenyon, John S.; Knott, Thomas A. (1953). A Pronouncing Dictionary of American English. Springfield, MA: Merriam-Webster Inc. ISBN 0-87779-047-7. ^ Oxford Dictionary of National Biography (2004). "Edmond Halley". Westminster Abbey. Dicapai 3 May 2015. Laman ini diubah buat kali terakhir pada 03:22, 25 November 2017.